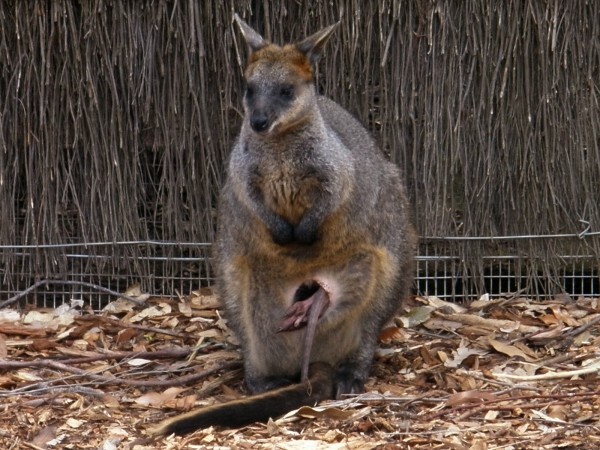 When I think about a mother kangaroo and her baby joey, I always think of a cute head poking out neatly out from the mommy’s pouch. But as I’ve learned, the truth is not always as pretty as that. This one seems to have stuffed itself in headfirst, and decided that it was cozy enough that way, with the head inside and feet and tail poking out. And this is pretty common among the kangaroos and wallabies we’ve seen. We were wondering whether the joey was going to stay upside down or somehow flip itself over but it stayed like this for quite awhile and we eventually moved on. So, have you seen a baby joey upside down like this? Yeah, the two headed kangaroo’s freaked me out more then I thought they would! Some things are better left for cute professional pictures:-). .-= Rebecca´s last blog ..New Zealand â€“ Couches Buses =-. Haha, I think the stuffed animal makers won’t make much money if their design looks like this picture! Also, if you try and get in to a kangaroo’s pouch and ride one, they won’t appreciate it. There’s also a lot of mucus in there. MUCUS??!! Is that by experience, Josh? Oh, is that from the Simpsons or Family Guy? It looks like he just dove in in a hurry! Haha, that’s true. Maybe it’s easier/faster to crawl in head first. Hmm… I always find that the kangaroo in the pouch is a bit disturbing to look at! .-= Brooke, WhyGo Australia´s last blog ..Things You Should Know About Australia =-. OMG, I love roos!!! I have never seen one like this before! Mmm. Borderline gross? It looks like reverse birth. Wierd. .-= Jen´s last blog ..How To Move To NYC With Ten Dollars Or Less â€“ Part One =-. Haha, this is why kangaroo stuffed animals don’t portray the joeys this way: it would freak the buyers (and their kids) out!